This story comes with such gravity for the sport, how did that added layer of importance influence your edit? It’s not often one gets editing opportunities like this. Karen Frank: John’s images beautifully capture Bill’s athleticism, grace, and optimistic spirit. The poetry of the underwater images speak to Bill’s quest for excellence and his ability to succeed as a male in a female dominated sport, and evolve the sport in doing so. What was your biggest challenge logistically? 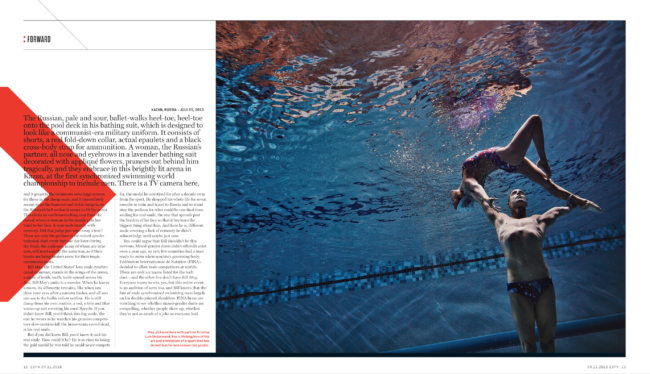 Kristen Schaefer Geisler: Our biggest challenge was getting this shot before the swimmers left for Russia to compete in the World Synchronized Swim Championships; finding time when the three swimmers’ schedules could overlap in between busy lives and schedules. What type of direction did you give John for this? 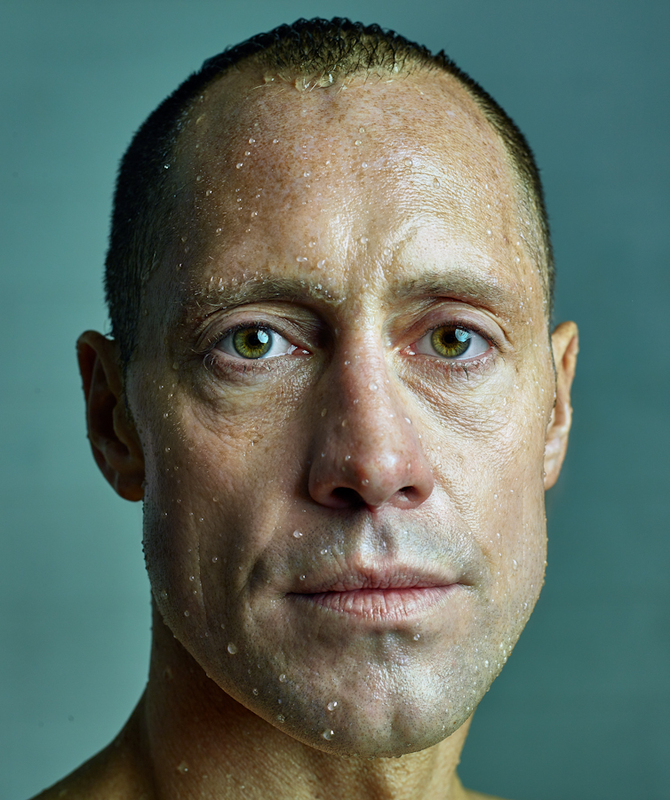 KSG: I assigned the shoot to photographer JOHN HUET after noticing on his website that he had shot syncronized swimming before. I talked a lot with the writer of the story Taffy Akner, who had just spent days with Bill and could describe in great descriptive detail Bill’s personality, which helped us conceptualize direction and a shot list. We asked John to capture beautiful underwater synchro swim pictures with his duet partners, above water portraits, as well as a-day-in-the-life of Bill May backstage at his Cirque du Soleil O show. 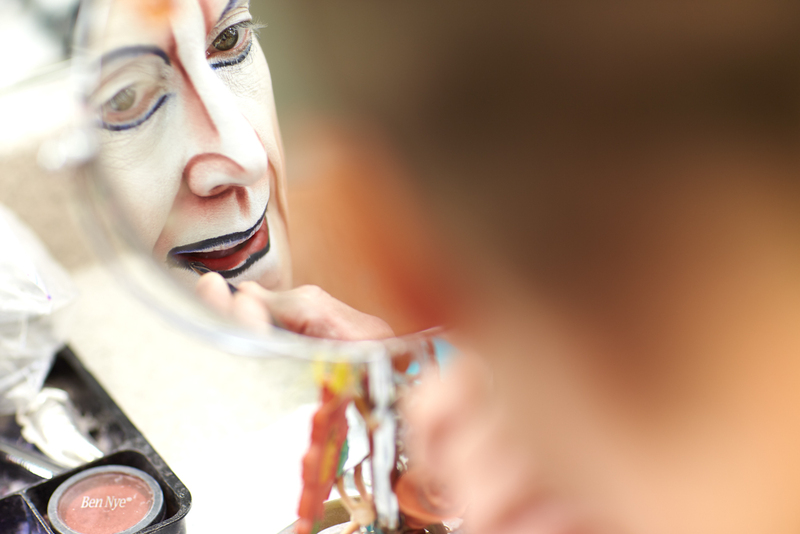 We got access to photograph him teaching an abs class to his fellow Cirque dancers and putting on his show makeup before going onstage. I know it’s unprecedented for ESPN to devote this many pages to a story, what moved the needle for the team to green light this? KF: There is a strong commitment to long form journalism at ESPN. Taffy’s story about Bill was so compelling, and John’s images were so strong, that we all felt it was necessary to give this story lots of room in print as well as digitally. What made this project a stand out for you? 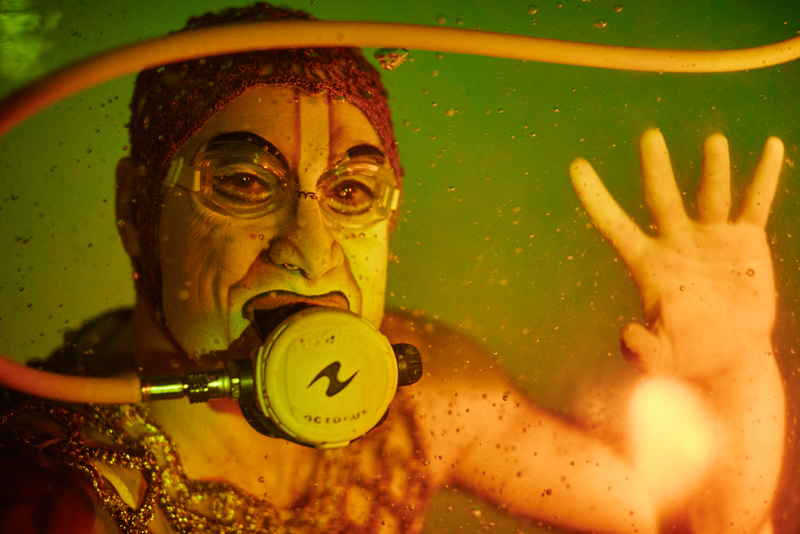 KSG: This story is visual and theatrical; both in the synchronized swim choreography as well as the Cirque O show – we needed a photographer who could capture Bill’s personality and bring artistry and point of view to the pictures. In a few words what is the most rewarding part of your job at ESPN and how has this title impacted your career? KF: There are so many stories that can be told through the prism of sports. ESPN recognizes the power of visual storytelling and the rich opportunities to do so across all its platforms. Working across those platforms has broadened my vision of how photography can be leveraged and sharpened my ideas about how the story is told in each medium. Heidi: Did you do have to adjust your shooting style at all for something this unique? John: I don’t really adjust my style for different projects, nor can I really define my own style. This simple story sum things up nicely – Alfred Eisenstaedt was hired to shoot our college portraits. He came into my class of 20 kids, and he asked everyone, “What kind of photographer do you want to be?” I was one of the last kids to be asked, when it was my turn, I replied, “fashion photographer.” He asked why. He’d not asked any of the other kids this follow up question. I panicked and blurted out, “Because I like girls!” Everyone in class had a good laugh, and then Alfred later explained that being a fashion photographer is no different than being any other type of photographer. You have a subject in front of you, treat that subject in front of you the same as you would a gown on a hanger. It becomes a portrait of a gown, just as if a person was standing there. So, I don’t look at myself or categorize myself as a sports photographer, I see myself as a photographer, and I see the subject in front of me as a subject. At the end of day, all photographs are solved with the same notes, regardless of the subject matter. Was this pool designed as a viewing room? No, I’m a certified diver. I was underwater. You have a long running history with the Olympics, what spoke to you as a photographer about this project? Synchronized swimming is really beautiful. It’s very similar to figure skating, especially in pairs. The artistry, the incredible athleticism. Most people don’t understand the caliber of these athletes. 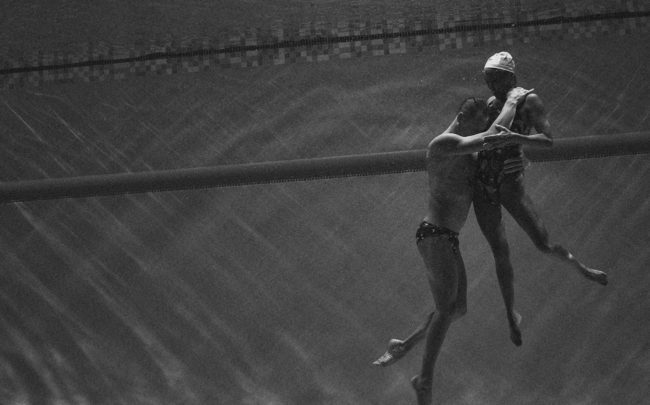 My prior experience with shooting synchronized swimming had been at the Olympics. In Athens and London, I shot from an underwater window, and in Beijing, I shot from above the window. So much of the SS routine and so much of what is going on happens underwater, so I wanted to be under the water to capture this experience. If I had more control for this ESPN project, I may have done things differently, maybe picked a different pool. 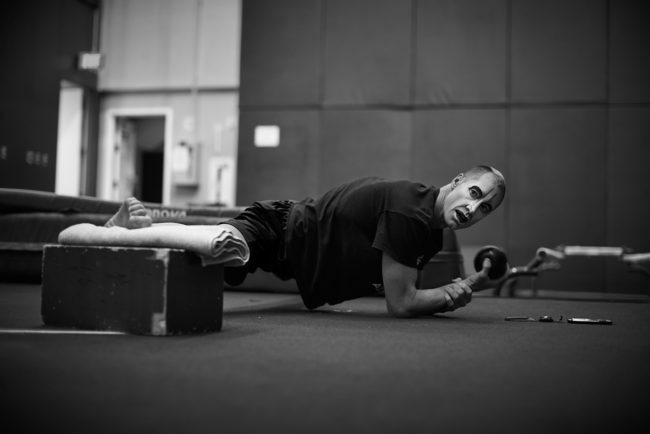 What you have to keep in mind is I’m working with world class athletes, training for a World Championship a month before their event, so I can’t do anything to screw up their routine or throw them out of whack. I have a deep understanding that athletes have rituals and patterns, everything needs to follow their well-laid-out plans. I had about 1/2 hr to do the deck images. They do a series of poses before entering the water, then I captured what I could capture while they were doing their routine underwater. Practice was about 3 hrs. I was allowed to be in the pool, only to watch and, of course, not get in their way. For the out of the water shots, how if at all did you direct them and how much time did you have? I didn’t have to direct them at all. It was awesome to have their coach right there directing them, perfecting their moves while I was shooting. I got another 1/2 hr at the end of practice; talked with them for about a minute above water, then we went underwater. We communicated via hand signals, and I tried to direct them to where the light was best. Did you propose the variety of color and BW to the magazine or simply turn in the images? I proposed this, along with running the images upside down. I sent in about 80 images, which I shot over three days, but it was more like a 2 day shoot since it was so broken up. I scouted, shot some of the scout, then the next day shot all of the images in the water, then I went back to their practice, even though this wasn’t part of my schedule; I did that for me. 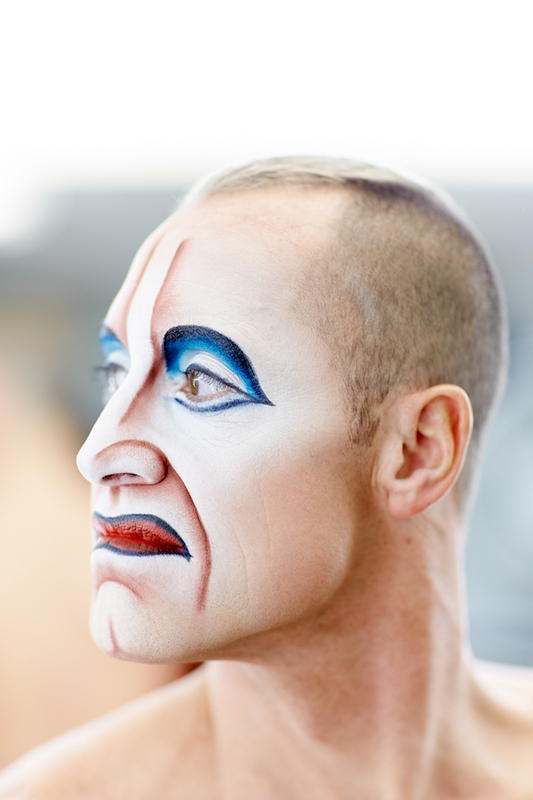 Bill had a big send-off party at O, the Cirque du Soleil show in Vegas, which I also photographed. He and the two women in the photographs, Kristina Lum and Christina Jones, were doing a performance at O. I shot Bill getting ready for the show and shot the first portion of the show under the window, which was really tough because it was so dark. Bill would come over to the window, mug for the camera and then swim off. With every job, I have the same process. I do an edit after looking at everything. Once I have my edit, I’ll retouch the images and then send in only my retouched files. For this particular project I ended up going back to review the shoot, and over the course of 2-3 days, I sent in small batches of additional images because I kept changing things, looking at images differently. How did the idea of these surreal, upside down images develop? You’ve been photographed many times, what was different about shooting with John? 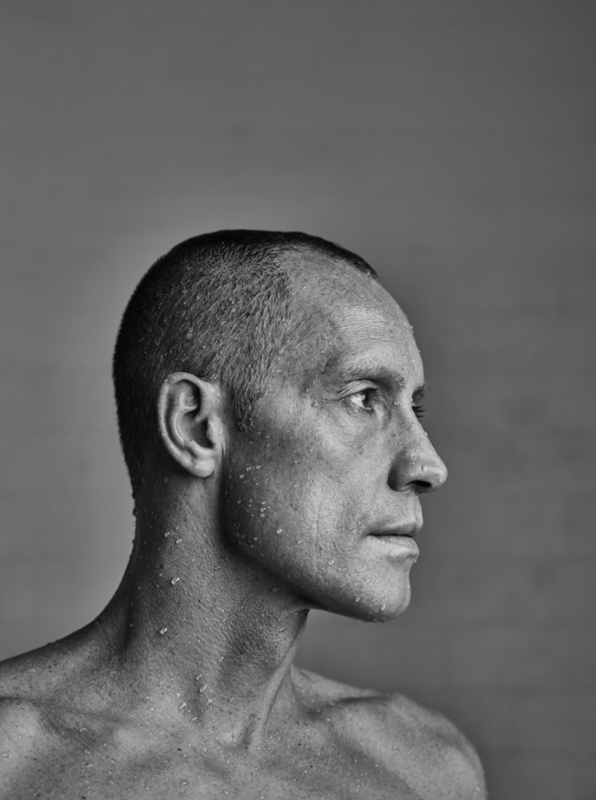 Bill May: The difference between John and many other photo shoots was that John had a very clear idea of what he was looking for and what would create the most beautiful images through a collaboration between us as the athletes and him as the photographer. 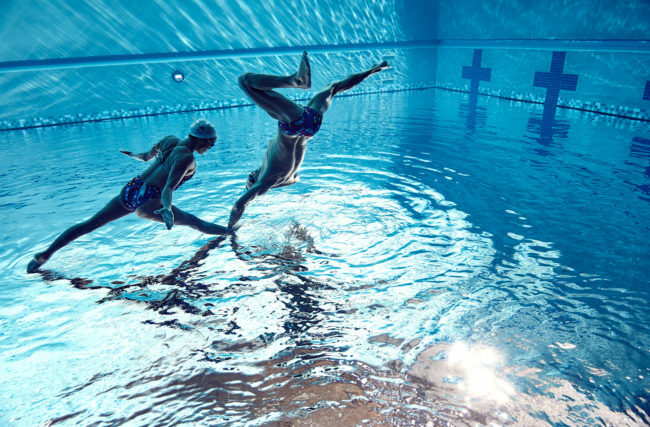 Many times a photographer will come in and shoot solely a stale image of only part of what we are trying to represent as synchronized swimmers. John truly showcased the athleticism of a sport that, unfortunately, often has a reputation as simply just a show sport. Did you free form poses for John, or did he direct you when you were out of the pool? John was our eyes, so we would begin by free-forming poses, and John would take what we presented and elevate it to something amazing. Tell us about having your dream taken away or shelved for almost a decade, and then re-present itself. I would never say that my dream was taken away from me because my career in Synchronized Swimming was much bigger for me than a few competitions. I would not be where I am today if I hadn’t taken the path I chose to take. However, I believe that timing is everything. 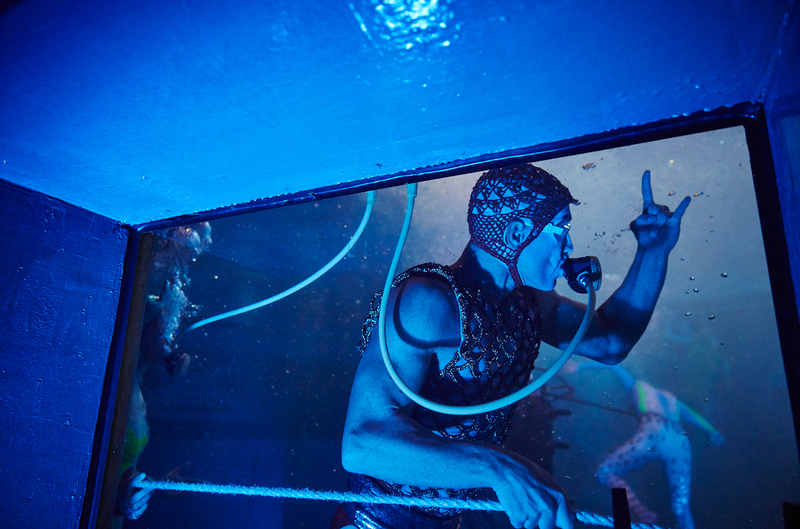 I was very lucky to continue to train and be involved in synchronized swimming in a show, so when the opportunity arose, I wanted the challenge. 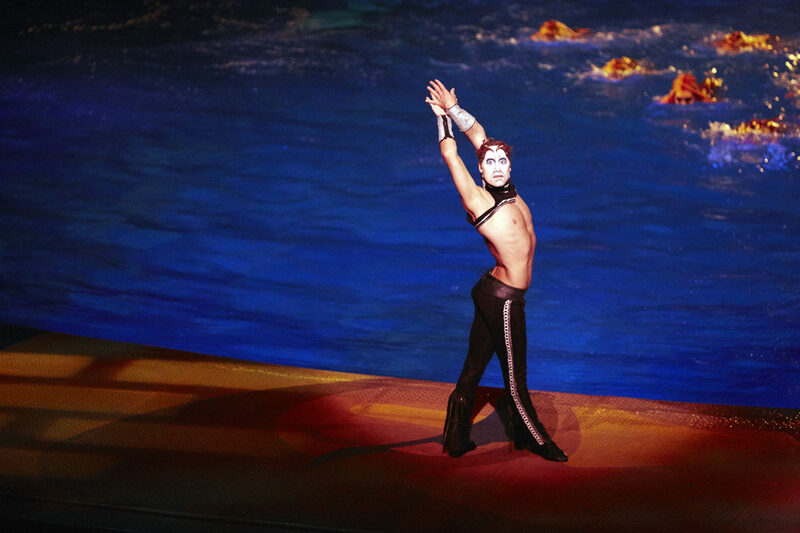 I think the interest is much greater for men in synchronized swimming today than it was a decade ago. There is a possibility that if it had been added to the World Championships 10 years ago, it might have fizzled due to lack of participation. 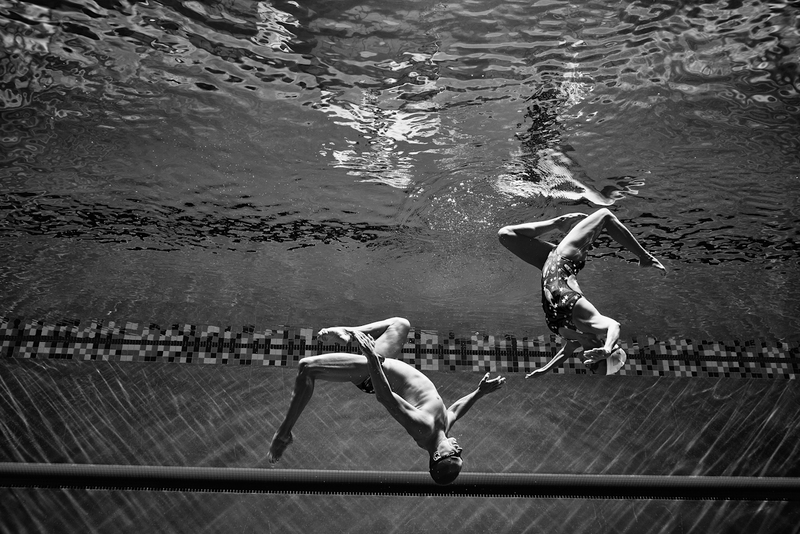 Now I am once again in full training, hoping they will create an Olympic Synchronized Swimming event for the Mixed Duet. What advice do you have for any athlete who has the seemingly impossible dream in a mostly female sport? The advice I have for any athlete is to do the sport that you love, first and foremost, before worrying where it will take you. Everything else will fall in line, and the rewards will be much greater than when relying on a what is and might not be possible. We cannot all write our future, so I truly believe that the happiness we create for ourselves today is what gives us our happiest memories in years to come. What impact do you hope this story has for the sport? The Mixed Duet is a brand new event at the World Championships and major international competitions, and I think through John’s pictures it shows as a beautiful, and more importantly, an athletic event. 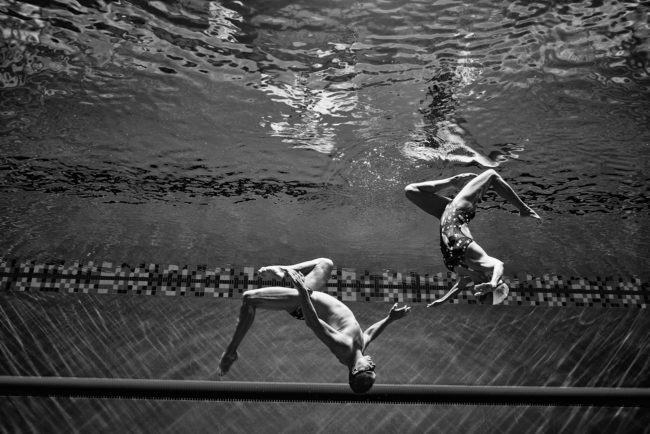 We are in a big push to get this Mixed Duet event into the Olympics, and I think his photos have created an interest that makes people want to see more. I truly believe he has helped our sport, and above all, the Mixed Duet in so many ways, and I am forever grateful. It was such an honor to work with John. His professionalism and talent are unrivaled. He was so respectful of our time and photographed with ours and our sport’s best interest in mind. Beautiful images and lighting. Nice work John! Thanks for sharing APE.